How cute-do they like mirrors too? 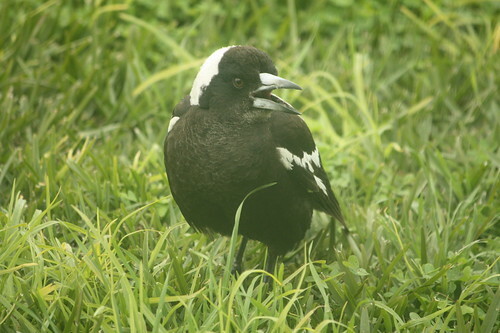 I have never seen a Magpie talking to a mirror. it must have been a pleasure to hear the magpie sing. Oh that is a cute shot…Happy weekend and hunting too. Oh yes….bird song, you can’t beat their song renditions….ever!!! PS….tomorrow [each Sunday] I have a bird blog meme for photos of birds, you should consider linking up with this post….you’ll find my bird blog link on my sidebar. Beautiful shot for this week’s theme. I am sitting on the terrace listening to the songs of birds right now . . .
Great shot for photohunters this week. I love listening to birds sing. Thanks for visiting mine and in answer to your question, it was a gradual thing. I l guess I mostly just lost the energy for singing and playing music. I would love to hear a magpie in song. Great photo for theme. My song is up. Please stop by.